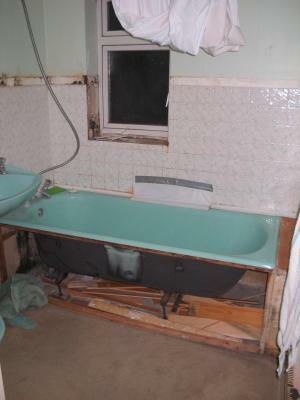 A while back, our landlord very kindly offered to have our bathroom redone, as it was showing its age a bit. We gladly agreed, and a couple of months ago he came round with a plumber/handyman to do various bits of assessing and measuring (those with long memories may remember the incident). This week, he finally started work. Except that he did two days, and then apparently decided that the job was harder than he thought, and he needed a mate to help him. However, acquiring one will take about two weeks, in in the mean time we have an entire new bathroom suite taking up space in our living room, and our bathroom looks like the picture on the right. I hope they are going to replace all that yecky wooden bits with bricks and plaster and tiles. I am surprised that the wood does not warp or smell and look funny after a few years of use. I’m a landlord, so I know you just can’t rip someone’s place apart while they are renting it. You should ask for one month’s rent back if you consider what he did to the apartment made it unliveable. Check the statutes in your area. Brian: I guess I could make a fuss, but the landlord’s a really nice guy, the rent’s not too expensive, and there’s no reason to annoy him when he’s doing us a favour. He didn’t have to get the bathroom redone. Everything still works – it’s just ugly.